Windows 10 was first unveiled in September last year since then a new era has begun for everyone associated with Windows. With the vision of empowering people, an organization on a single platform, single store and across devices of smallest, largest and no screen products has finally arrived. More than five million users feedback have been incorporated in Windows 10, and it has been offered as a free upgrade for genuine Windows 8.1, Windows Phone 8.1 and Windows 7 customers. Windows 10 is accessible and available in 190 nations from today. The celebration has begun and by tagging #UpgradeYourWorld on social media, a global nonprofit organization will receive a cash donation. More information on Upgrade Your World is available at http://www.windows.com/upgradeyourworld. 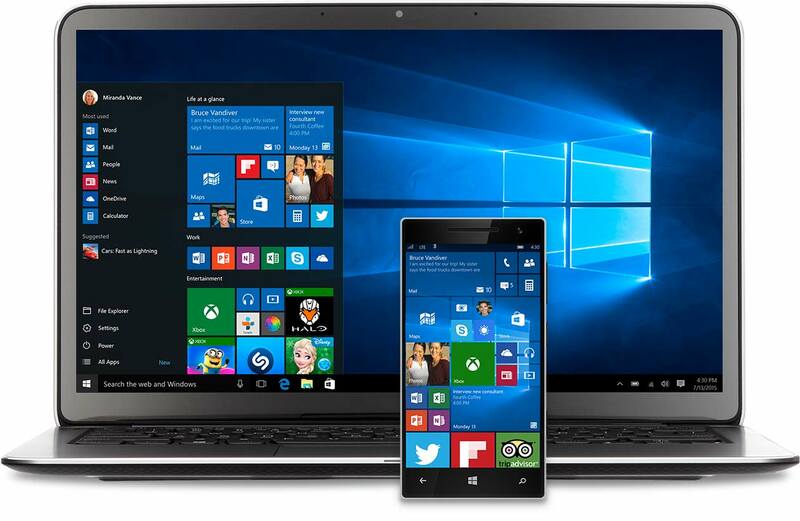 1) Windows 10 is fast and familiar – The start menu, Taskbar, Desktop and Live Tiles all look superb. 3) More personal more productive – Gesture, Pen and Voice for interacting with your PC. And the new Cortana that is your personal digital assistant to find correct info at right time. 4) Microsoft Edge – a new Internet browser that allows fast access to online world. With the new built-in enterprise security, options for replacing passwords for employees have become more secure than ever. All kind of data that needs protection from corporate identities can now feel safe and Azure cloud strength has improved a lot. Windows 7 and 8.1 users can take advantage of this free upgrade on PCs and Tablets. All the free and paid games, movies, music, apps and TV shows will work seamlessly on all Windows 10 devices. Cortana the personal assistant will control all the app tiles and get all the real time notification for your. Try the new Windows Store and I am sure you will fall in love with it. Opening the settings app and clicking on devices. Click on the mouse and tab with touchpad. Right now Windows 10 will force you to download new updates directly from The Internet, it means whenever a bad update goes in your system might go into endless reboot cycle. You can stop all that from happening. Go to Settings > Network & Internet >Wi-Fi > Advanced Options > Set as metered connection and now you will always be asked before any updates. Go to Settings > Update & Security > Windows Update > Advanced Options > Choose how updates are installed. From here you will be able to set a schedule for restarts. Go to Settings > Update & Security > Windows Update > Advanced Options > Choose how updates are delivered. By this you will save your bandwidth and unwanted file sharing with people you don’t even know. In the start menu by default you will get all the apps alphabetically and if you have tons of them installed, then its a bit hard to find or scroll every time for a frequently used app. This can be solved by using all app list in the start menu. If you press ‘W’ you can find programs like Microsoft Word. By installing Windows 10 in express mode your default browser has been changed and you will be getting Microsoft Edge as your new default browser. This can be undone by going to Control Panel > Programs > Default Programs > Set your default programs. Let us know if you have any more issues in Windows 10, we will try to help you out. This concludes our tips and tricks of Windows 10. What all can Cortana Control in Windows 10? Search the Web – Cortana can search for you on Bing, if you are using Firefox and Chrome then you can use other search engines like Google as well. Open up Apps – Just click on microphone icon or if you have enabled “Hey Cortana” it can open any app for you. For example say ‘open Word’ and it will open. Email Draft – With a Outlook email account, you can tell Cortana to send an email to John” and it will open your Outlook with a draft ready to be made. Music Controls – Saying ‘next tract’ and ‘skip song’ are my favorite ones, and Cortana quickly recognizes these. All of these commands are being used with Spotify. Set a Meeting – You can schedule a meeting on Outlook account by saying ‘schedule a meeting’ and she will as you more about it. Like a date, time and location. Wi-Fi off and on controls – You can tell you PC to turn Wi-Fi off or on, and it will be done quickly in a flash. No need to go to settings or action center.